Jim Rimoshytus has designed leather gloves to get rid of animal hair. With three cats, a dog and a rabbit, Jim Rimoshytus has a lot of experience with fur. He tried everything: vacuuming, sticky tape roller, duct tape wrapped around his hand. Then the Newport firefighter noticed that fur seemed to cling to the leather sections of his gear and he got an idea. 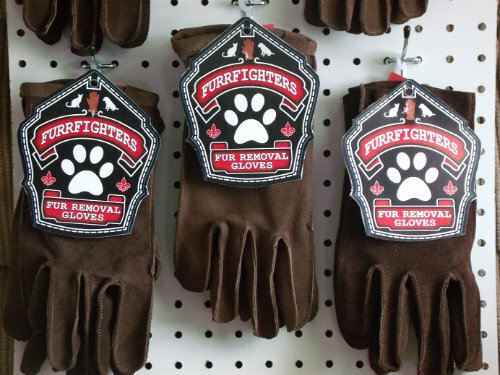 He designed a pair of leather gloves and launched a line called Furrfighters. When you rub the gloves over a surface covered in hair, it sticks to them. Then to get rid of the hair, you can just slap the gloves together. “We did some testing and research and tried different kinds of leather and came up with this one that really seems to grab onto the hair,” he says. “It attracts everything.” It also works with dandruff, lint and dust, he says. Rimoshytus has also designed a version for hair removal on the go, called the Pocket Furrfighter. It fits over two or three fingers, comes in several colors, has a key chain and is much smaller than the typical roller. The products are manufactured in Fall River. The Warren resident selling the gloves through his website and also at Pet Foods Plus in Bristol. He wants to expand the business: he and his brother just tried out for “Shark Tank,” and he’s applying to a program through Walmart that supports locally made products. There may be applications beyond pets as well. Rimoshytus says a recent order came from a barber in Florida looking to pick up human hair. For more information go to furrfighters.com.